Adebayo Akinfenwa's brace of goals ensured Newport County began life without manager Justin Edinburgh with defeat at AFC Wimbledon. Edinburgh's appointment as boss of League One side Gillingham had been confirmed earlier on Saturday. Akinfenwa drilled home an early header, but failed to beat Joe Day with a penalty when Kevin Feely was sent off for bringing down George Francomb. But Akinfenwa made amends when he turned in Francomb's cross. It was an ignominious start for Newport caretaker boss Jimmy Dack as County fell to a fourth successive League Two defeat. "In the second half we wanted to get the boys a bit braver and make sure our quality shone through. "We knew if they made it a scrap, they'd be better at it than us. "The penalty moment you think is going to be a game-changer, but that's not how it worked out." "Up until the sending off I thought it was a good performance. "We were getting back into the game - obviously the goal killed us in the first half - but I thought we played well in then first half, there wasn't a lot in the game. "Second half we started off and I thought we were the better team, pushing and looking to get the goal and there was only one team in it until the sending off." Match ends, AFC Wimbledon 2, Newport County 0. Second Half ends, AFC Wimbledon 2, Newport County 0. Attempt missed. Miles Storey (Newport County) left footed shot from the centre of the box misses to the right. Attempt missed. Yan Klukowski (Newport County) right footed shot from the centre of the box is too high. Attempt blocked. Andy Sandell (Newport County) right footed shot from outside the box is blocked. Alfie Potter (AFC Wimbledon) wins a free kick on the left wing. Attempt missed. Aaron O'Connor (Newport County) right footed shot from the centre of the box misses to the right. Mark Phillips (AFC Wimbledon) wins a free kick in the attacking half. Foul by Lee Minshull (Newport County). Substitution, Newport County. Lee Minshull replaces Max Porter. Max Porter (Newport County) wins a free kick in the defensive half. Attempt missed. Adebayo Akinfenwa (AFC Wimbledon) header from the centre of the box is too high. Substitution, Newport County. Yan Klukowski replaces Adam Chapman. Goal! AFC Wimbledon 2, Newport County 0. Adebayo Akinfenwa (AFC Wimbledon) right footed shot from the centre of the box to the high centre of the goal. Darren Jones (Newport County) is shown the yellow card. Alfie Potter (AFC Wimbledon) wins a free kick in the defensive half. Foul by Darren Jones (Newport County). Substitution, AFC Wimbledon. Adebayo Azeez replaces David Connolly. Substitution, AFC Wimbledon. Alfie Potter replaces Sean Rigg. 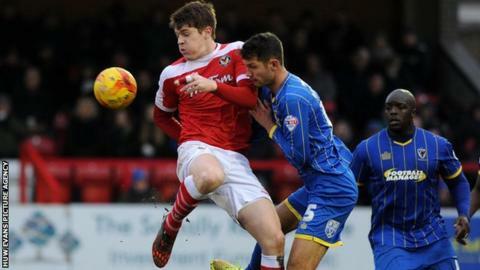 Hand ball by Callum Kennedy (AFC Wimbledon). Corner, Newport County. Conceded by Adedeji Oshilaja. Adam Chapman (Newport County) wins a free kick in the attacking half. Attempt saved. David Connolly (AFC Wimbledon) left footed shot from the left side of the box is saved in the centre of the goal. Substitution, Newport County. Miles Storey replaces Chris Zebroski. Dannie Bulman (AFC Wimbledon) wins a free kick in the attacking half. Penalty saved! Adebayo Akinfenwa (AFC Wimbledon) fails to capitalise on this great opportunity, right footed shot saved in the bottom left corner. Kevin Feely (Newport County) is shown the red card for a bad foul. Penalty AFC Wimbledon. George Francomb draws a foul in the penalty area. Penalty conceded by Kevin Feely (Newport County) after a foul in the penalty area. Corner, Newport County. Conceded by Sean Rigg. Foul by David Connolly (AFC Wimbledon). Ismail Yakubu (Newport County) wins a free kick in the attacking half. Ryan Jackson (Newport County) wins a free kick in the defensive half. Ismail Yakubu (Newport County) wins a free kick in the defensive half.